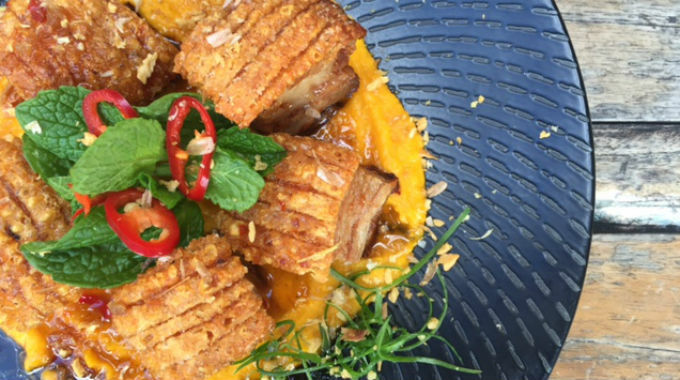 Did you know there’s a restaurant just out of the CBD where you can take a seat, say ‘I’m hungry’ to the waitstaff, and have them bring you out 7 courses of delicious Vietnamese fare (on Wednesdays you can even get it gluten-free!) for $55pp? Or what about the decadent French inspired dining spot in Paddington where you can tuck into delectable share plates before indulging in crème brulee and catching a movie just next door? What if we told you they were one and the same? If you haven’t cottoned on yet, we’re talking about Libertine, a unique French-Vietnamese restaurant and bar at The Barracks. Here, classic French cooking techniques meet fresh Vietnamese flavours in a luxurious atmosphere for a dining experience like no other. Whether it’s a loved up dinner date under the sparkling chandeliers before you take in a movie (you can splurge on 5 courses and a movie ticket for $35 on Mondays! Who said romance is dead? ), or a street food feast with cocktails and friends outside under the stars you’re planning, this is the place for you. If it’s the street food feast you’re after, you can get it for a song between 5-6pm Monday to Friday, or 2.30-5pm on Sundays, when you can order any dish from the street food menu and receive another one for free. So you’ll have more dosh to spend on cocktails! Our hot tip for what to order from the delicious menu is the ‘Bang Bang’ BBQ duck crepes, which are so good we’ve been know to order multiple plates of them. But there’s plenty more to choose from, including crispy ‘popcorn’ Hanoi eight-spiced chicken, Bangalow pork spring rolls and steamy 5 mushroom dumplings. Need something more? There’ll be no saying ‘I’m hungry’ after a few shared plates of masterstock-braised beef short ribs with Asian vegetables and hot and sour sauce, red duck curry and organic pork san choi bao. And dessert of course – no one could resist apple and cinnamon spring rolls with vanilla bean ice cream! As for the drinks, you’ll find the same French-Vietnamese influences all over their cocktail list, with sweet sips like the blueberry and vanilla mojito and a minty (and boozy) Vietnamese lemonade. Pitchers and carafes are perfect for group gatherings – and for pairing with those 2-for-1 street food dishes! You can even host a function in the heritage listed space, canapé or banquet style, and let Libertine take care of all the details. Insider’s tip: host a function during the week or for lunch and you’ll get sneaky bonus towards your bar tab. 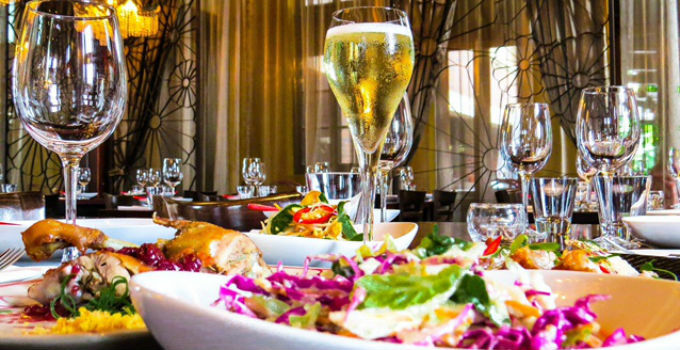 Day, night, fancy or relaxed, large or small groups, Libertine has something for everyone, including Brisbane’s best banquets! You’ll find them at The Barracks on Petrie Terrace, open for dinner 7 days and lunch Wednesday to Sunday. Words by Ranyhyn Akui Keeping the G&G up to date with all the latest tasty tidbits requires a lot of double lattes and espresso martinis, so we occasionally need to give out some sponsored love. But rest assured that we only work with businesses that we think are really nifty, as the sponsor for this post is!